This recipe is from my Mom who originally found it in Cookies Galore (Post Cereals). She made these a lot when I was little and they fit quite a few of the criteria for comfort food. As you can see they are really easy, delicious and have an interesting knobbly texture. They are kind of like brownies but not as rich. I used Kashi 7 whole grain nuggets instead of Grape-Nuts. If you have the Grape-Nuts, then you probably have all of the other things on hand. You can add coconut or a half a cup chopped dates. Melt shortening in saucepan. Add cereal and cook about one minute. Add sugar and mix well. Cool. Stir in egg and vanilla. Sift flour once, measure, add baking powder, soda, salt, and sift again. Add flour mixture to cereal mixture, a small amount at a time, mixing well after each addition. 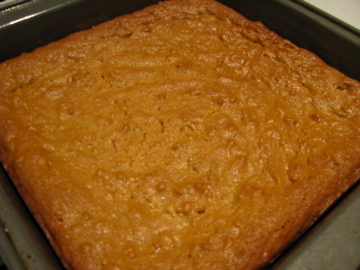 Spread into a greased 8x8x2 inch pan and bake in a moderate oven, (350ºF) about 20-25 minutes. Cool. Cut into bars. Supposedly makes 24 (My Mom says: I don’t think so!) They go really well with a glass of milk or vanilla ice cream.